I have heard the expression that certain food was so “thoughtfully” prepared many times, on food shows, books and in discussions…but never quite understood (really understood) what that meant. How in the world could food be “thoughtful”? 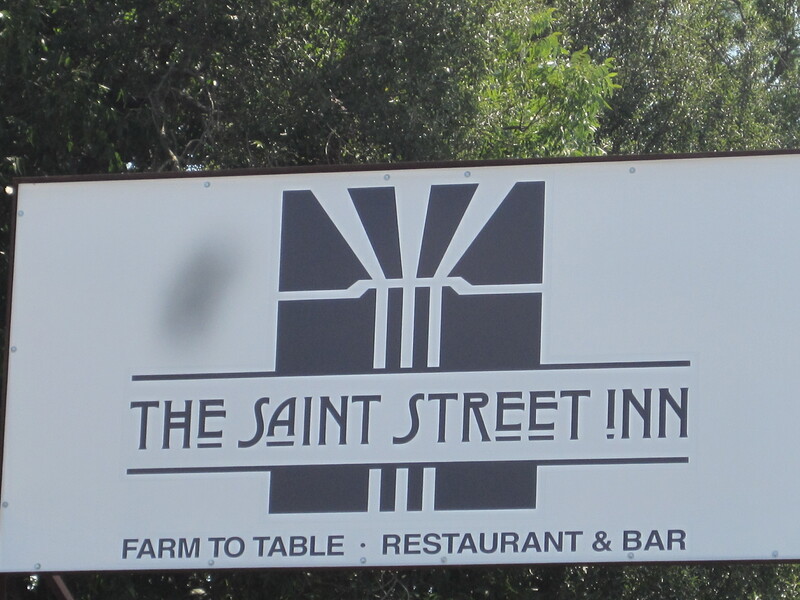 But, after 3 dining experiences at a new restaurant in town, The Saints Street Inn, I knew! I finally knew what was meant by that term… I felt it in every dish that was served at our table (and let me tell you, we ate some food!). Tomato Basil Soup (Soup of the day): Sweet, yet tart enough to satisfy the longing for what a fabulous tomato basil soup should be. Shrimp and Corn Stew ( Special of the Day): What a delightful surprise, with a hint of roux blended into a tomato based shrimp stew! The corn added just the right amount of crunch to the bowl and the seasoning had just the perfect amount of heat. Loved it! 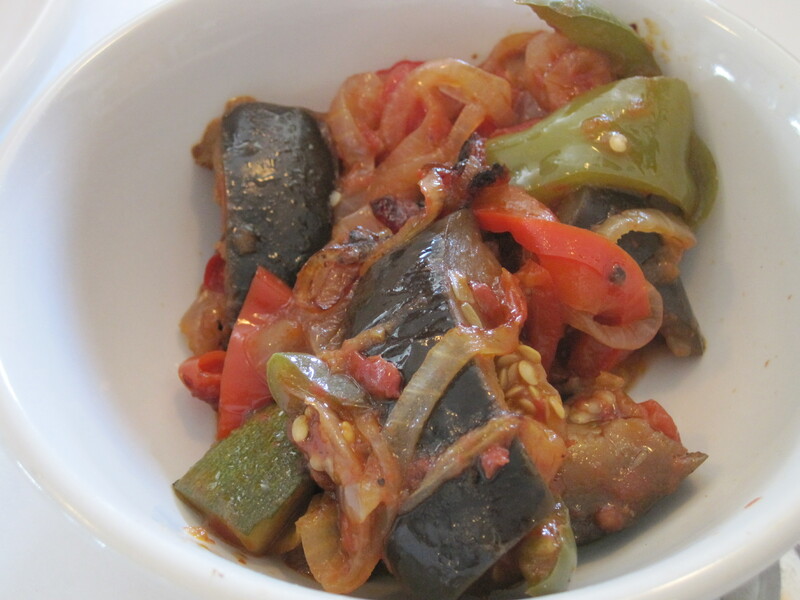 Ratatouille: You know when all of the ingredients are fresh from the farmer’s market…you just know! The combination of eggplant, bell peppers, onions, zucchini and yellow squash in the lovely fresh tomato sauce was spot on. 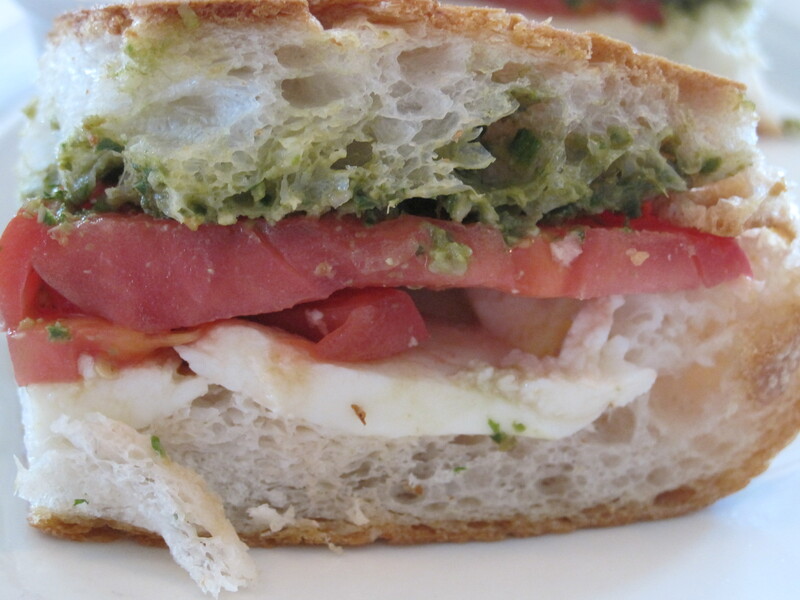 On another visit I opted for the Ratatouille sandwich with feta, homemade pesto on ciabatta…WOW!! That worked! Stuffed Creole Tomato: Huge fresh boiled shrimp in a very light remoulade sauce with fresh herbs…My husband wasn’t wanting to share this great dish, I promise! I did get a little bit and yes, I understand! Summer Crab Salad: I saw this plate of “deliciousness” from across the room and had to ask, “what in the world is that beautiful thing”! Add their enormous boiled shrimp on top of the crab salad and THAT really works…They use a fresh creamy jalapeno and mint dressing that is so fresh and unique! 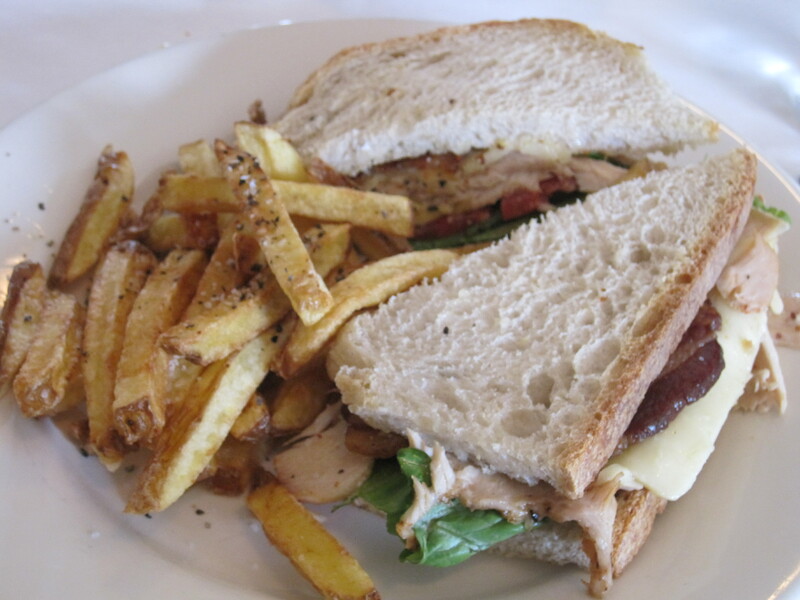 Saints Street Club: Not just another club sandwich, I promise! When my daughter said that it was the best club sandwich she ever had, I paid attention! She is quite choosy about what she calls “favorites”, so I had to have a bite, of course. She was right…They use perfect thin slices of roasted turkey, fresh avocado, sprouts, fresh ripe tomato, crispy bacon and she opted for fire jack cheese. She will be back! Caprese Salad Sandwich: We weren’t quite sure about this, so we ordered it as an appetizer and had it cut into pieces…This might have been a favorite! I have been thinking about it ever since…even made a home version of it! It combines perfect thin slices of mozzarella cheese, ripe tomatoes and homemade pesto (that has just the right balance of olive oil, basil, garlic and pine nuts for a sandwich) on a fresh ciabatta roll…who would imagine? I want more! Cold Watermelon Soup (Soup of the Day): (with a topping of lump crabmeat…mmm) I love cold soups (I pretty much love all soups), so I had to try this creation! And what a creation it was…expecting a pinkish red soup, I was quite surprised when I saw it… a bright beautiful yellow! As I took a bite, I tasted a hint of lemongrass…a bright, delicious and creative addition to a very unique soup. 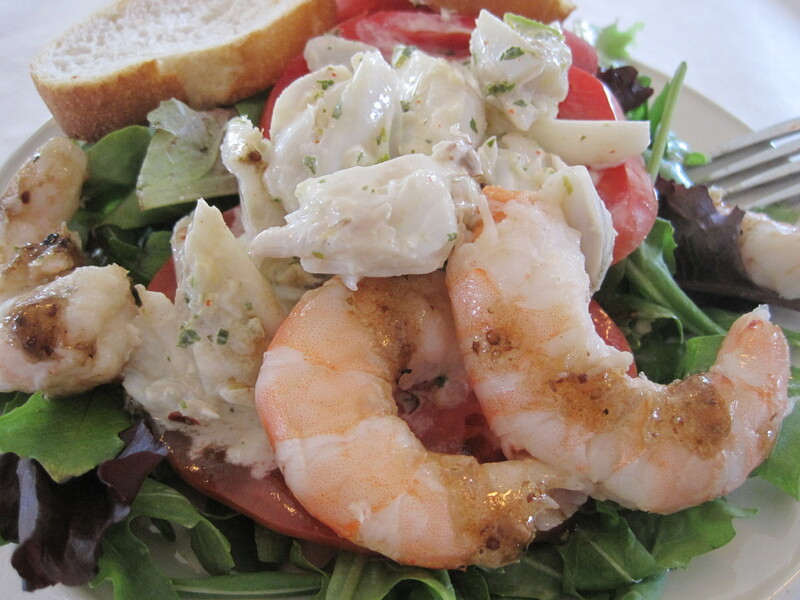 I absolutely loved it…and well, the lump crabmeat sprinkled on top…lagnappe! 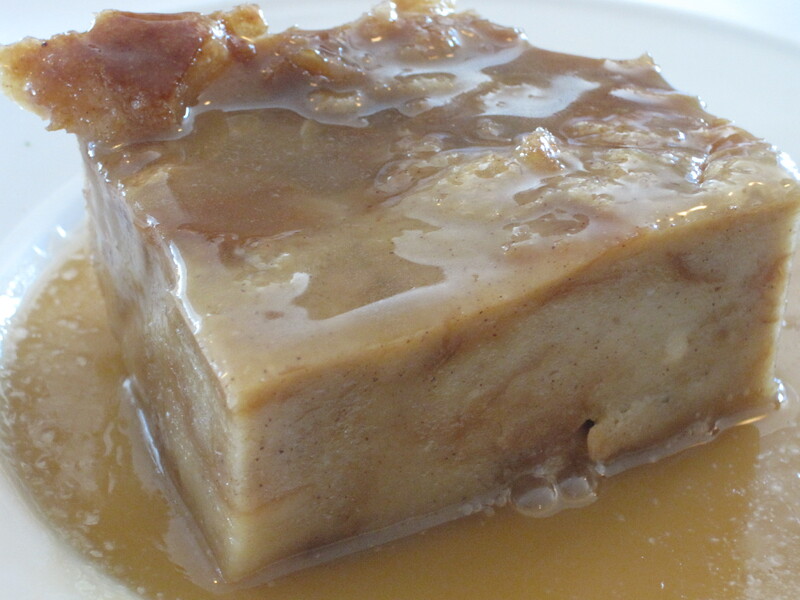 Bread Pudding with Praline Sauce: A wonderful firm bread pudding with what tasted like a deep and rich praline just melted on top of it…you know the kind of praline that your moma used to make…rich, sweet and buttery! Melt in your mouth good. This is what I call “thoughtful” food…first and maybe the only time I will use that term, but it fit! And this fresh “farm to table” food really works,…really, really works! I’ll be back, for sure! 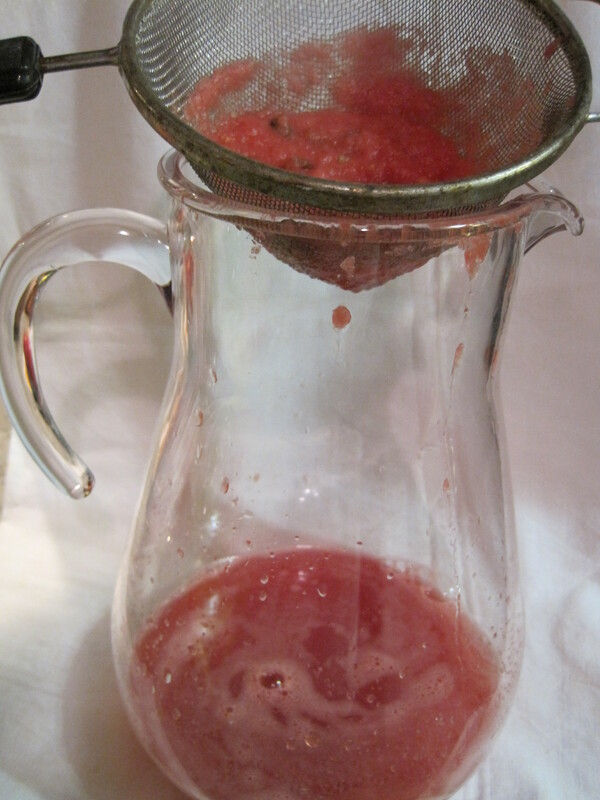 Watermelon Agua Fresca and Fever! 1. 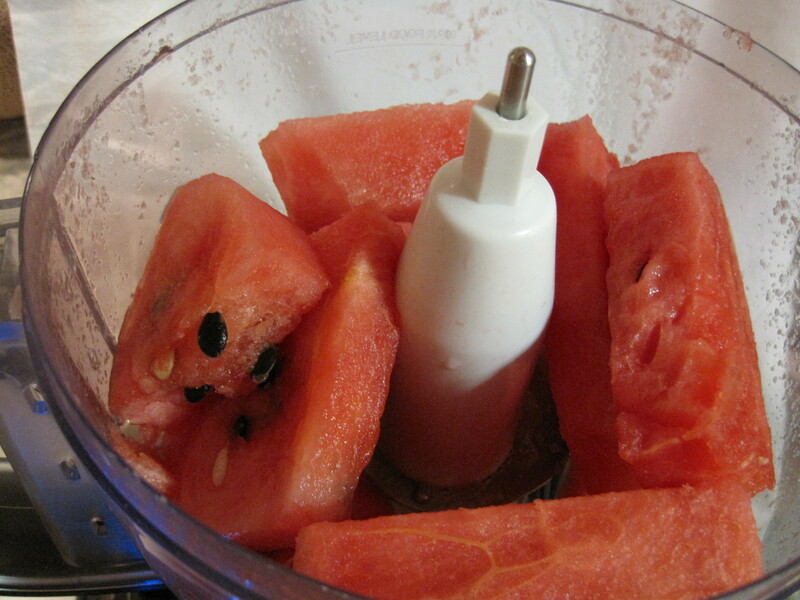 Put Watermelon in Blender or food processor and puree. 2. Stain into tall pitcher. 3. Add water, lime juice and sugar. 4. Chill for at least 1 hour. 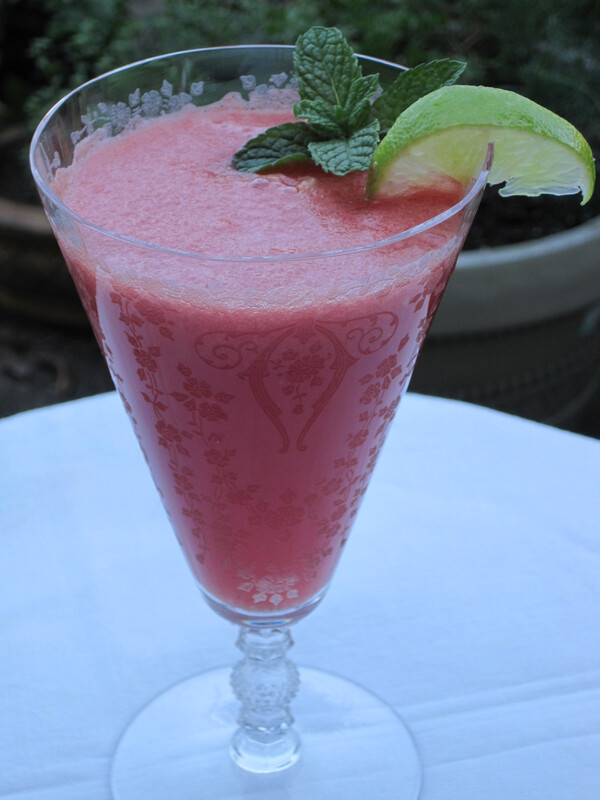 Serve it chilled or in a tall glass of crushed ice, topping with a slice of lime and a bit of mint. You can use any fresh fruit that is in season…try cantelope, strawberries or honeydew. Did this work on making my husband feel better? Not for long, but at least I put a smile on his face for a few minutes!! Cochon on my mind, once more! Since last Saturday night’s adventure to Cochon, I just couldn’t get this place off of my mind! Maybe it was all of those fabulous flavors that kept running through my head….or was it because everywhere I went people were talking about this new and interesting restaurant? I think it was the memories of those wild popping flavors that persuaded me to call for a Friday lunch reservation. I gathered three other food lovers (my husband, oldest daughter and co-worker/daughter’s best friend!) and went on down to see if it was really as good as I remembered Saturday Night. Well, I am telling you now….if possible, it is even better! And a big “hats off” to our waiters! We had a team of two waiters that were incredible…charming, attentive and knowledgable. That works every time! We decided to share a variety from their “small plates” (or appetizers)…Don’t want to miss anything! 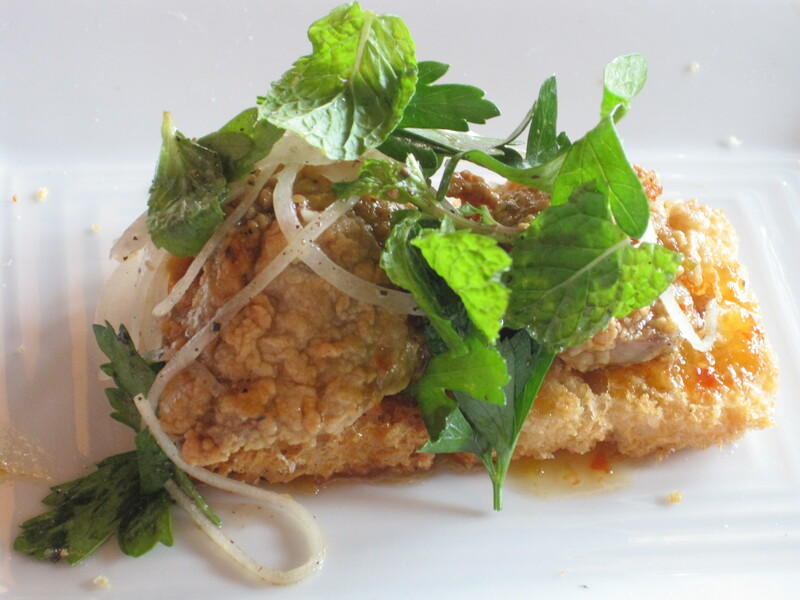 Fried Chicken Livers with Pepper Jelly Toast: My favorite. I tasted and loved it Saturday night… repeated the incredible experience…consistent…Yes! Wood-Fire Oyster Roast: I had missed this, but now I learned what all of the talk was about….Plump, briny oysters, lightly roasted under a real wood fire with an awesome aioli sauce that knocked our socks off! Smoked Boudin with pickled peppers: Again, consistant with what was served on my previous visit….dissapeared from the platter quickly! Fabulous! Braised Pork Cheeks with Spoon Bread, Soybeans & Crushed Herbs: If you are not familiar with “pork cheeks”, then just trust me on this one…melts in your mouth tender! The most tender pork I have ever eaten. Then to serve with spoon bread? Crazy good! 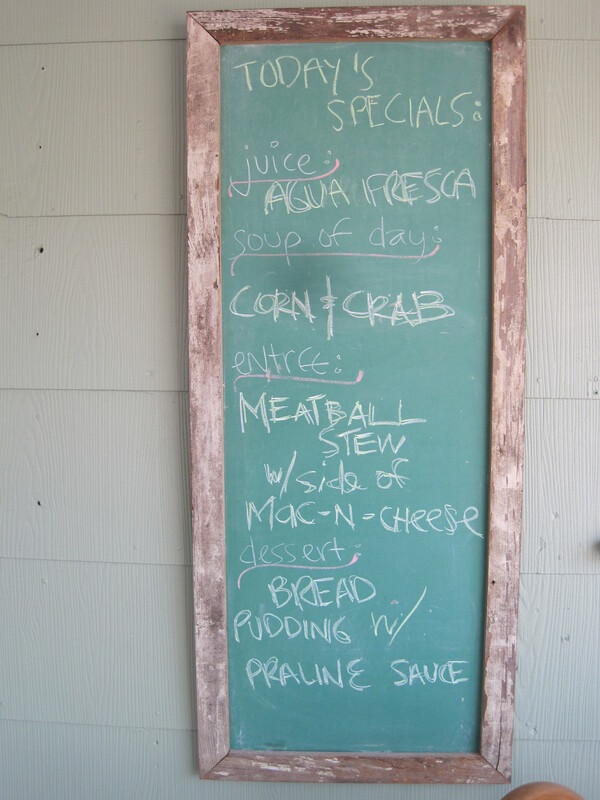 As if we had not had enough, we went on to order Entrees…. Catfish Courtboullion: My husband’s favorite…and he has had plenty of courtboullion experiences in his life! Fresh, sweet, tender catfish swimming in a bowl of tomato based sauce with just a hint of roux. We all had to try some, not only because it was so appealing, but because he kept going on and on about the delicious flavors…he was right! 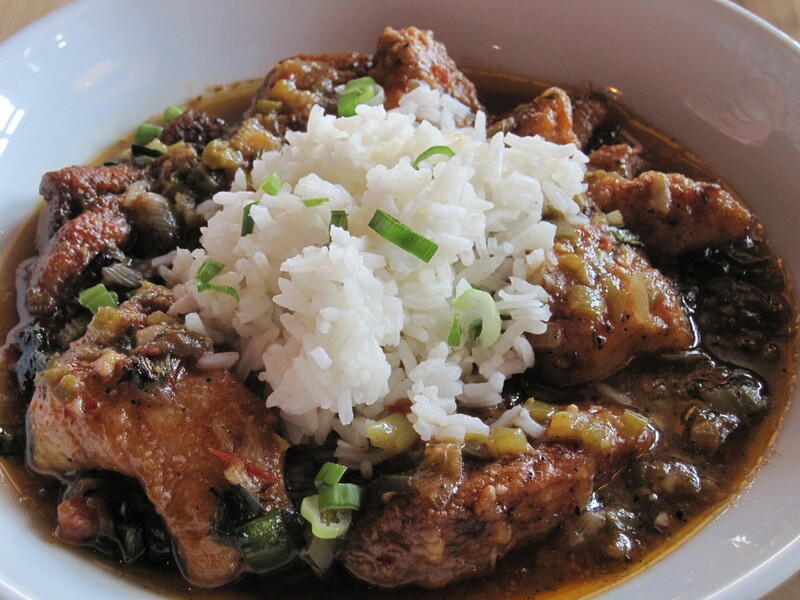 Fried Alligator with Chili Garlic Aioli & Fresh Herbs: My co-worker’s entree…she loved it! The batter was perfectly seasoned and had just the right amount of crunchiness that coated the fresh, tender pieces of alligator. She paired this a side order of creamy grits, that were indeed creamy! Perfect. 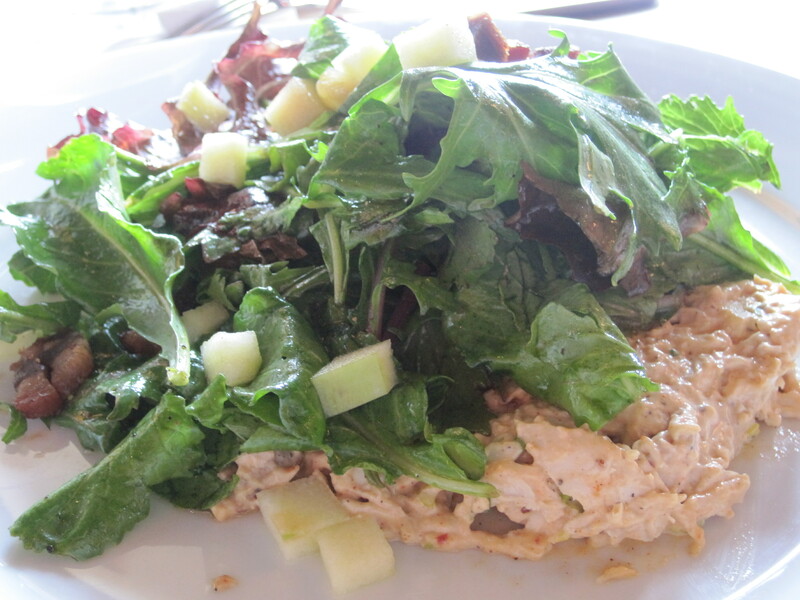 Chicken Salad on a Bed of Mixed Greens: My daughter’s selection (one of the specials of the day)…Light, creamy and beautifully seasoned! She loved her dish. Saved mine for last, because it was a “to die for dish”…. Rabbit & Dumplings: This was so good, that I don’t know how I could possibly go back and not order it over and over. 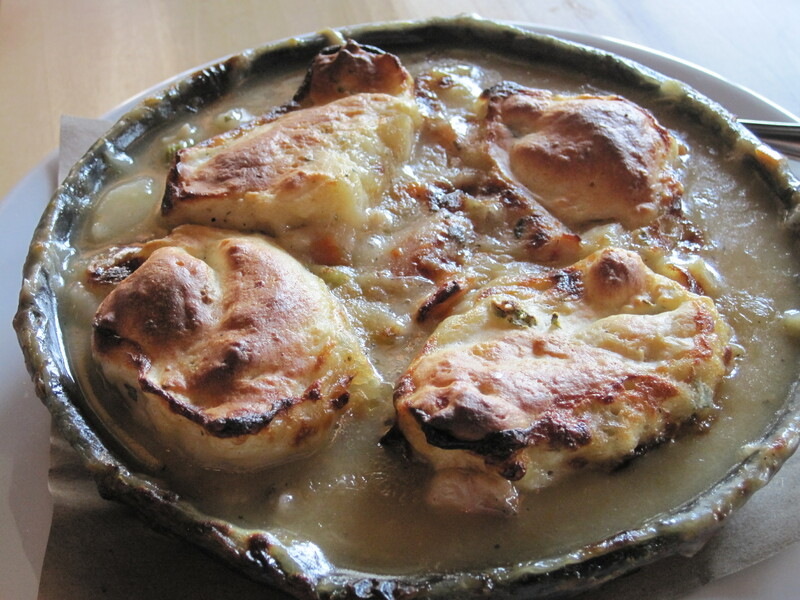 Reminiscent of an old-time pot pie that someone’s grandmother might have made, using dumplings instead of pie dough! The presentation was almost as beautiful as the flavors. It appeared in a small rustic cast iron skillet, still bubbling from the oven. But, when I slid my spoon in and had the first bite, my brain almost exploded! Deep, rich flavors from the creamy stock with tender pieces of rabbit, carrots, potatoes and turnips embedded under plump savory dumplings! Combining all of this into that small black skillet is genius!!! I will dream of this dish….On a cold winter day? This will be on my mind. Dessert…who had room for dessert? No one, but we pressed forward! We had a plan..try it all! Pineapple Upside Down Cake with Pineapple Sorbet… An individual small cake encrusted with caramelized pineapple sauce and a slice of pineapple. Wow! But, when you add the light, bright flavors of the pineapple sorbet along with a bite of the cake?! It was another highlight and favorite of mine…Loved it. Great food working in our wonderful city of Lafayette, Louisiana… We are lucky folks! Come to think of it, we have been eating pretty well for a long, long time. My husband and I have been waiting all week long for the LSU game tonight…why? 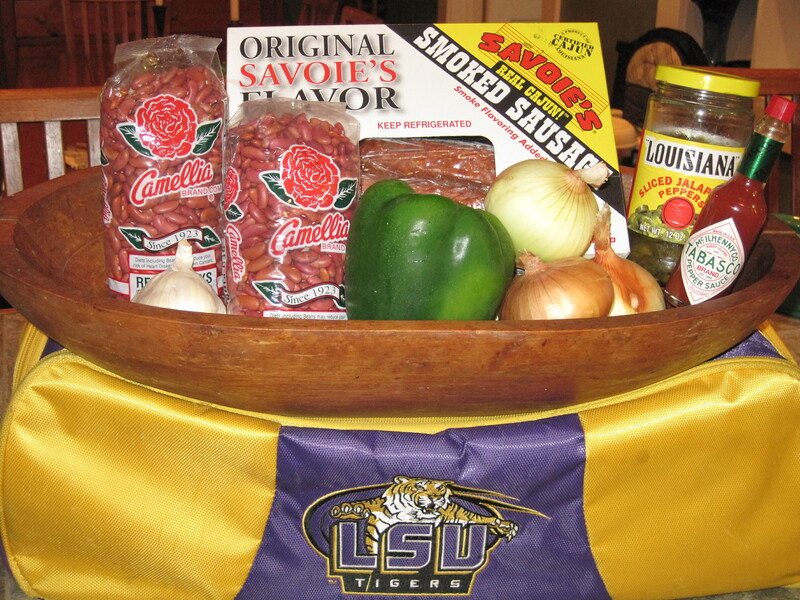 Not only because we love football season….so we can cook something and have a little excitement in the house! Robert (the great guy I married 26 years ago!) 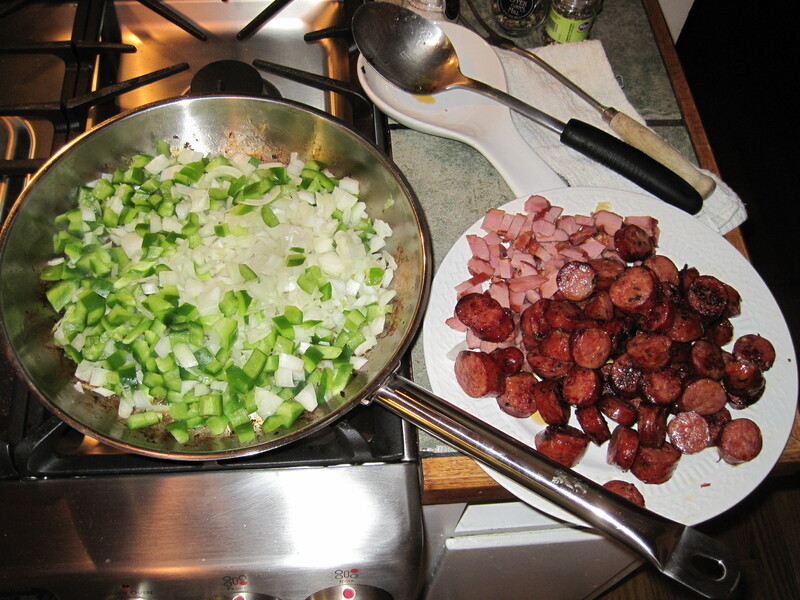 decided last weekend that on Thursday night, for the LSU game, he would cook Red Beans and Rice. 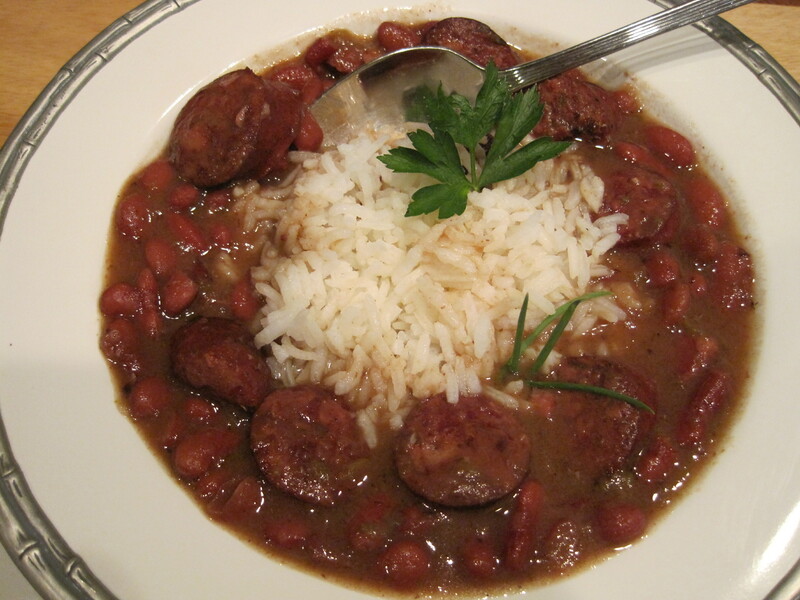 Bright and early Sunday morning, he went to Rouses and bought his Camelia Red Beans, Savoie’s Sausage and Tasso. He came home, all fired up, with Thursday Night Football on his mind! I can tell you that I don’t have the same reasons for loving football as my husband does….I am all about the commotion and cooking! Football Season excites me because when there is a big game on, there is a feel in the air (and in my house) that signals a party somewhere! It means food, gatherings and cooking something long and slow. Even if, God forbid, I find myself alone and there is a big game on, I will cook something! Imagine that…I can have fun alone…cooking! Sometimes, I don’t eat what I cook that night, but I sure enjoy myself. But, it is sooo much more fun to cook and watch a game with another person or maybe a lot of people. Maybe I don’t even sit down (I have this little TV in my kitchen) during the game….just stirring a pot and walking back and forth, talking to my husband will do. To me, that is a great day or night! Now, if you put me at a camp in Pecan Island, cooking, having cocktails, walking around with a fire blazing outside AND watching a big game…well that is all lagniappe! 1 Tsp. 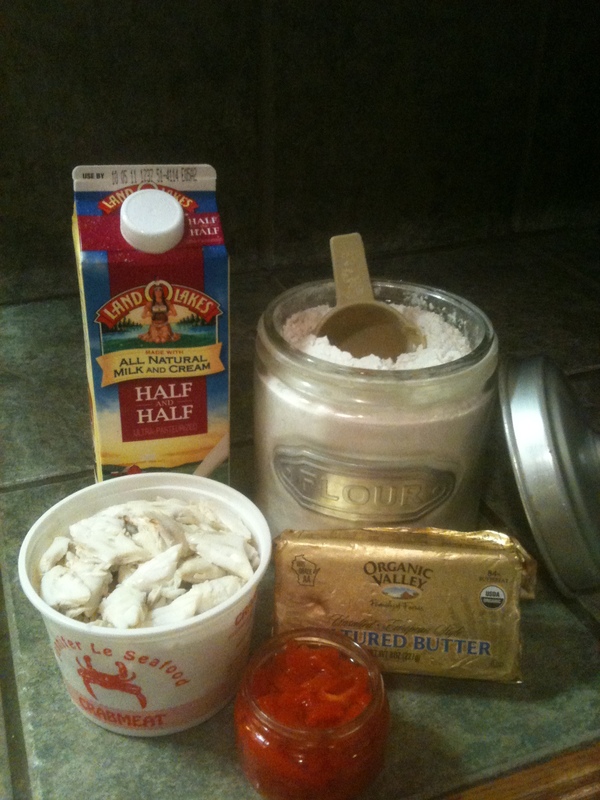 Old Bay Seasoning! Water: enough to cover beans plus 2 inches. Robert uses the water that he soaks the beans in plus whatever amount you need to get to your 2 inches…All approximate, depending on how thick you would like your sauce to be. 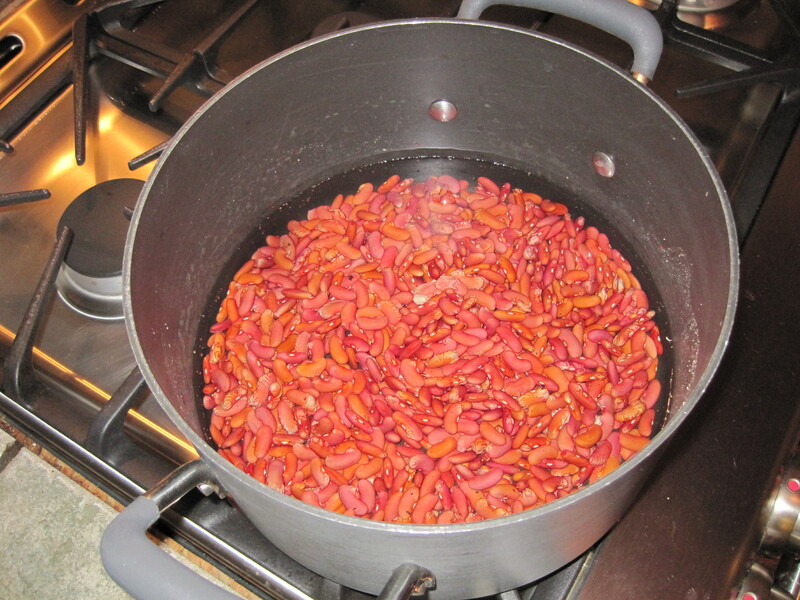 1) Soak beans…most important step! Cover them with cold water, and soak(at least a couple of hours). If you don’t, you will never get them tender!! Believe me, it has happened! Serve over white rice, sit back and enjoy the game!!!! When Robert makes food work, you better believe it’s good…. 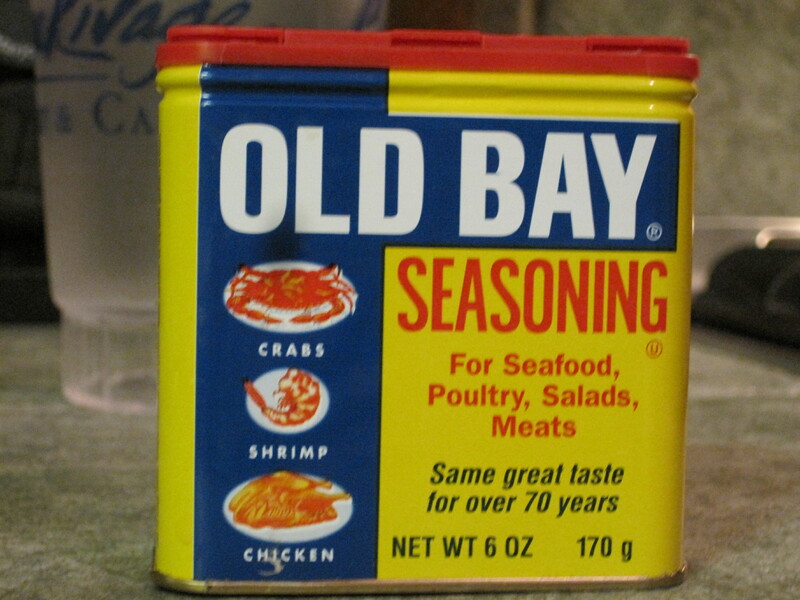 PS….The “Old Bay Seasoning” is a tip from one of the best cooks I have met lately…Ms. Rita, head cook, at St. Joseph’s Diner in Lafayette, Louisiana. She said that she never cooks Red Beans and Sausage without it! Try it, you’ll like it! It’s optional to add a few dashes of tabasco or hot sauce, a little lemon juice, fresh herbs or a few grates of fresh parmesan cheese. Just remember, this is not about the cheese, it’s about the crabmeat! 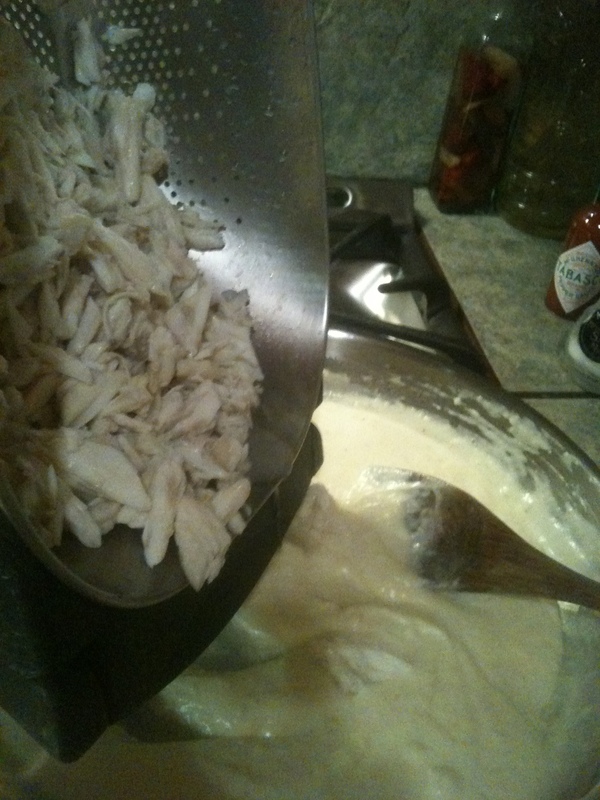 Empty the container of crabmeat into a colander and “gently, very gently” feel the lumps and remove any shells. This is very important! Nothing worse than enjoying a delicious crab dish, then starting to feel shells in your mouth…. Melt the butter in a skillet over a medium fire. 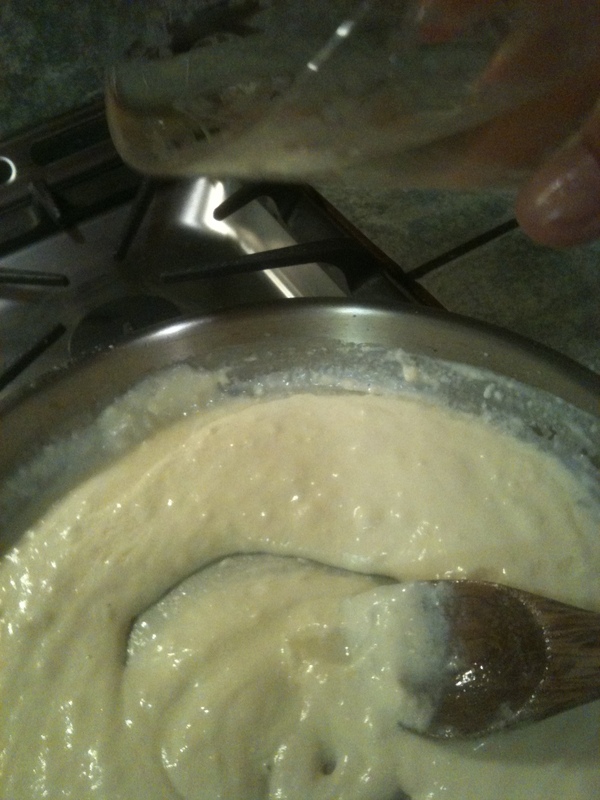 Slowly blend in the flour, stirring constantly, until it is nice, thick and smooth. Make sure that all of the lumps are gone! 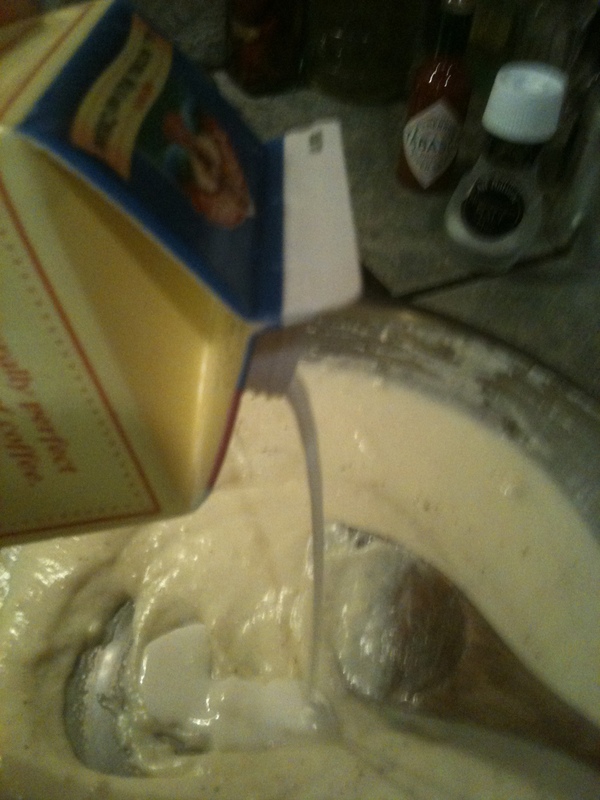 Slowly pour in the half and half cream, stirring as you pour. This is when you could add, just a splash (no more than a 1/4 cup) of white wine. 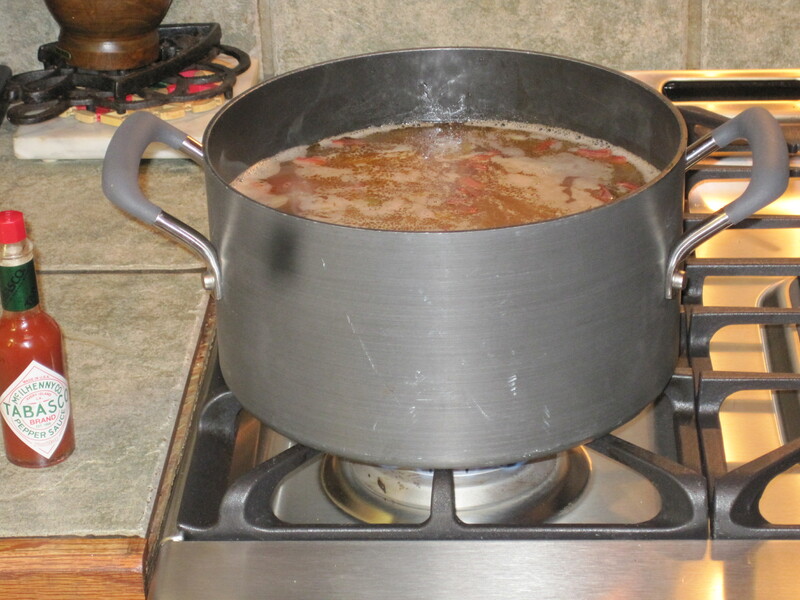 Continue to stir constantly until this becomes thick and velvety. Add your pimentos. Blend well. Add your seasonings. Finally, again…”gently” add in your crabmeat. Make sure that you don’t break all of the beautiful white lumps! Just sort of toss with your spoon, rather than stirring. 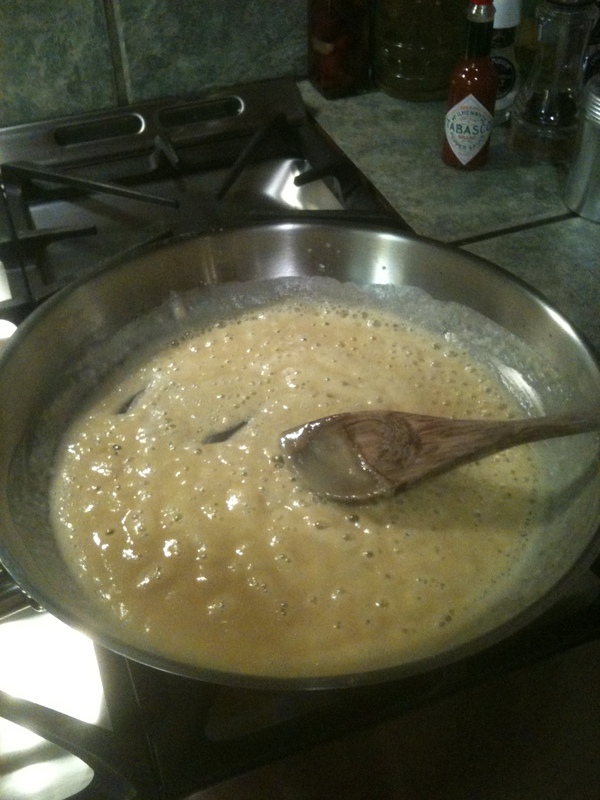 Pour this wonderful mixture into one baking dish or several ramekins. 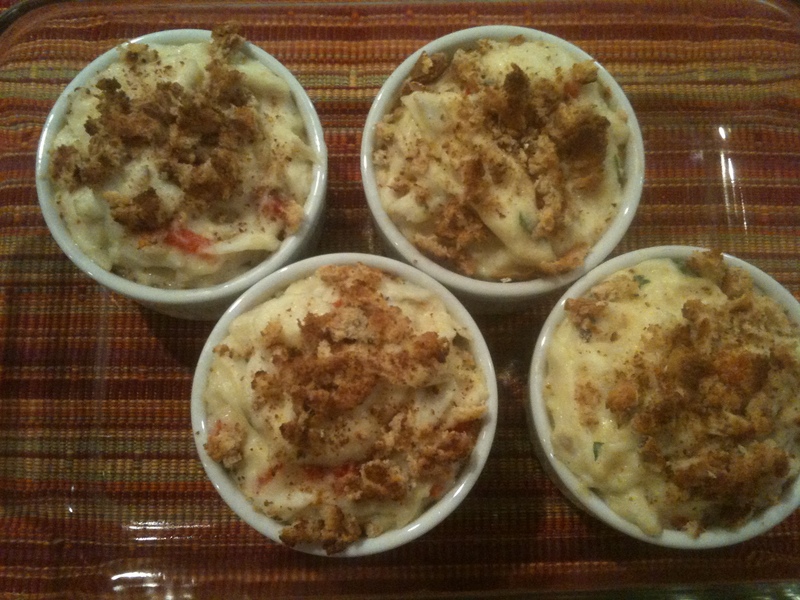 Now, tonight, I decided that I had to add breadcrumbs to the top. After rummaging through my pantry, not finding any ready-made, I took a piece of sliced bread (any bread will do) and put it in the toaster on high. Cooled it, crumbled it up and added it to the top. Just to add a nice crunch. Bake at 375 degrees until bubbly and the top is nice and golden brown. About 25 minutes. As I was sitting down with my hubby (to eat in our laps as we watched “Mantrackers” on TV) WAIT… Did I really just say that? Must have, oh well! After all of that “thraka” you would like to think that we could set a nice little place setting on one of our tables and eat like Ozzie and Harriet , but nooooo, tonight we are eating in front of the t.v…we don’t even have tv trays…perfect! Even with that thought in mind, I couldn’t help but think that this worked…and when food works, it’s all good! One happy husband and one happy Monday! PS..I’ve got to get someone to hold this iPhone or a camera while I cook! These pics are taken while I am holding my iPhone with my chin, snapping pictures, while I cook…not an easy task for a normal human being with only two arms and one neck! (In my right mind I can’t ask my husband, who has had a triple bypass, to not go out and exercise while I am preparing to feed him food laden with butter and cream…he might call the cops on me!) Have to figure this one out! Cochon…the rest of the story!
. The Smoked Boudin was amazing. Just the right amount of meat to rice combo (like it’s supposed to be!) And the smokiness was surprisingly subtle. Trying the Fried Chicken Livers with Pepper Jelly, just made me want to grab the whole tray! Perfection is all I can say. The Shrimp Salad on a thin crisp homemade potato chip was a wonderful treat to the palate. The lightness of the creamy shrimp salad (chocked full of fresh shrimp), with just an edge of crunchiness, sitting on the crispy chip was to die for… Then came trays of Lump Crabmeat, very lightly sprinkled with the most beautiful toppings of shaved pickled veggies, sitting on house made pepper crackers. Melt in your mouth good. Another fabulous treat. 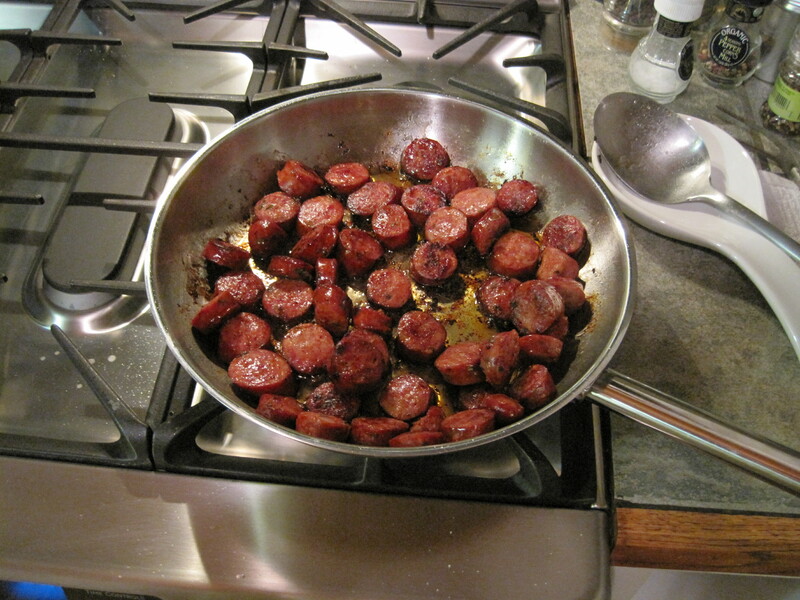 Trays of nicely seasoned grilled smoked sausage, topped with a dot of mustard, were being circulated around the room. Again, these were the happiest waiters that I have ever seen. Chef Link must be doing something right to inspire so many happy faces! I was told that their Wood Fired Roasted Oysters were the best thing since sliced bread, but didn’t get to try one. Then, if all of that were not enough, I looked upstairs to see a fully dressed whole Roasted Pig (of course head, feet and tail intact) being carved and served. Alongside the Roasted Pig, were Fried Cracklings and Roasted Pig Skin cut into nice size pieces with a huge bowl of Cochon’s refreshing Cucumber Salad. What a site for my eyes! To top off my evening and add to my collection, Chef Link signed one of their menus for me to take home. Yes, I collect menus of the restaurants I love and if I can get the signature of the chef, it is even a bonus. My husband swears that it will be our kitchen wallpaper one day! As we packed ourselves into our car to go home, I can honestly say that Cochon in Lafayette lives up to its reputation and is a delightful surprise, in that it not only appeals to those of us that want “pork – the real deal”, but obviously serves knock out dishes that are lighter. That is a perfect example of “When Food Works”, it’s all good. They won my heart over….which reminds me…I need to call for a reservation in the morning! Last night we went with a couple of close friends to a pre-opening party for the new restauant, Cochon, in Lafayette. Chef Donald Link and Stephen Stryjewski are officially opening this coming Thursday, September 15th. Just couldn’t be a more beautiful setting overlooking the Vermilion River. As we walked in, we were greeted with the most cheerful waiters with trays full of samples from the menu.